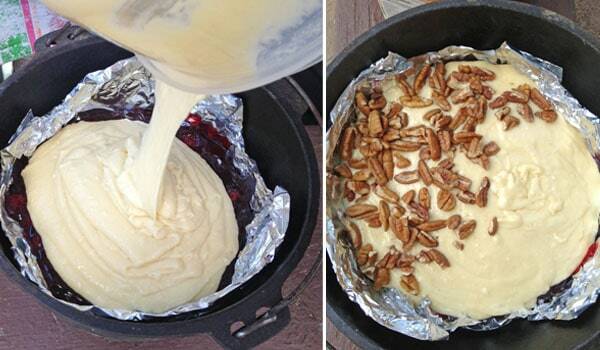 Here is a dutch oven dump cake recipe, that is a spin on the classic but made while camping! You can get the recipe at the bottom of the post. Who loves eating dessert while camping? This campfire dump cake is one of our very favorite camping desserts. 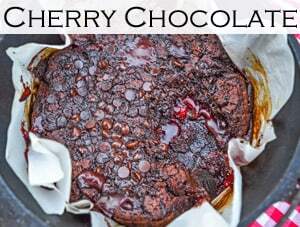 This recipe is so easy to make in a Dutch oven! 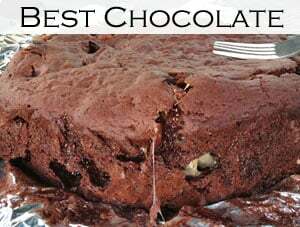 It is just one dutch oven dump cake recipe in our collection. 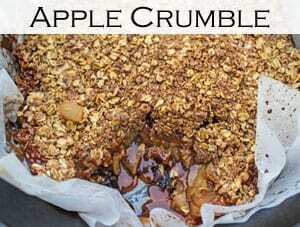 You will also enjoy our dump cake varieties: Lemon Blueberry, Pumpkin Pie Cake, Chocolate Cherry Lava, Caramel Apple Pie, and Cranberry Apple. The ingredients for this camping dessert are really easy. 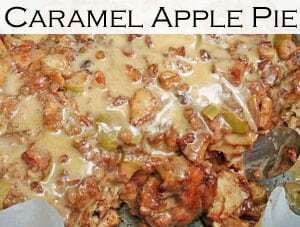 Get the full recipe is at the bottom of the post. Light charcoal hot coals for the dutch oven. This is how we start all our dutch oven recipes. Line the dutch oven with foil and spray with some cooking spray. You can also create your own Dutch oven liners using this tutorial. Dump the pie filling into the bottom of the dutch oven. Mix the cake mix and soda together in another bowl and pour over the cherry filling. Sprinkle the pecans on top. I just covered half since some of our eaters wanted it without. Place lid on dutch oven, cover with coals and bake for 20-25 minutes depending on your heat. Use your nose to test for doneness. We could really smell a strong baking smell and when we pulled it around 23 minutes. It turned out perfectly! If you can smell a burning smell, then you’ve baked it too long. The filling was really hot, but that didn’t stop everyone from devouring it. This is NOT a posed photo below. It was so delicious that we were practically fighting over it. Yummier than made in a conventional oven! A classic dump cake is made with a can of crushed pineapple. We tried using a full can of both pie filling and crushed pineapple and discovered that it was too wet for the cake to cook properly. If you want to include it, just use a half of a can of crushed pineapple and half of a can of cherry pie filling. 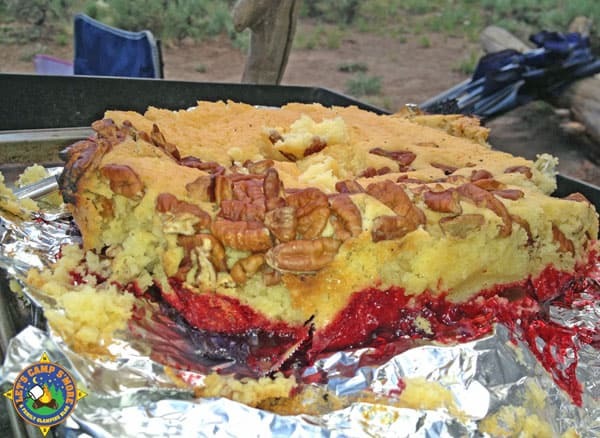 Enjoy a classic dump cake made in a Dutch oven while camping. Create hot coals for the dutch oven. Line the dutch oven with foil and spray with some cooking spray. Dump the pie filling or half pie filling and half crushed pineapple into the bottom of the dutch oven. Mix the cake mix & soda together in another bowl and pour over the cherry filling. If desired, sprinkle the pecans on top. Place lid on dutch oven, cover with coals, and bake for 20-25 minutes depending on your heat. Use your nose to test for done-ness. We baked ours 23 minutes. Yum! You had me at cherries and pecans! They are a tasty combo! This is a really great camping cake! Thanks so much for sharing with us at Full Plate Thursday and have a great week!